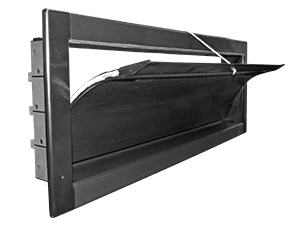 A poultry circulation fan system is used to break up temperature stratification and create more uniform conditions from one end of a poultry house to the other. A proper circulation fan system gently moves air across the litter while ensuring the birds are not being chilled. As that air moves across the litter, it picks up moisture from the litter to be exhausted out of the house. It is a very practical and efficient way to cut heating costs in houses drastically in the winter time, and also improve in-house conditions overall. Benefits of DirectAire Wide Guard Circulation Fans includes drier litter, lower ammonia concentrations, and better flock performance. Thus, DirectAire Wide Guard Stir Fans are important in your efforts to reduce costs and improve the environment inside your buildings during summer and winter months. Because warm air rises and cool air falls, there is often a 5 to 8 degree Fahrenheit difference between the ceiling and floor temperatures. One way to help minimize this temperature difference is to install DirectAire Circulation Stir Fans. The main purpose of air circulation is to cool and control the climate to reduce heat stress on your animals and keep production at the maximum level. DirectAire Wide Guard Circulation Fans keep your building dry by reducing the collection of moisture and condensation, and also to help dispel gasses and odors. The recycling of heat will reduce fuel costs and create a healthy environment for animals and workers. DirectAire Stir Fans are great for old houses that are not tightly sealed to reduce cold spots in poultry house. 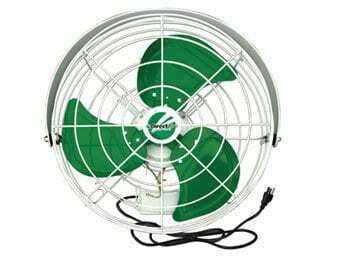 As seen below, DirectAire Wide Guard Stir Fans are available in three different sizes: 18", 20", and 24" and have a 1/5 HP sealed motor and steel ball bearings for years of longer life. DirectAire Stir Fans come with a 6 foot prewired cord and a swivel / tilt mounting bracket for easy installation in your poultry house. 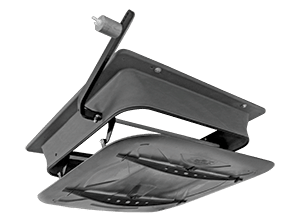 The Mounting bracket is included to easily swivel and tilt fan for easier cleaning and to change direction and angle of airflow in poultry house. The wide guard grill reduces dirt buildup and allows for easier cleaning of the stir fan. Each fan has two speeds - high and low - with an off switch. Box Size: 22.8" x 7.3" x 25"
We know how important energy efficiency is to your operation. 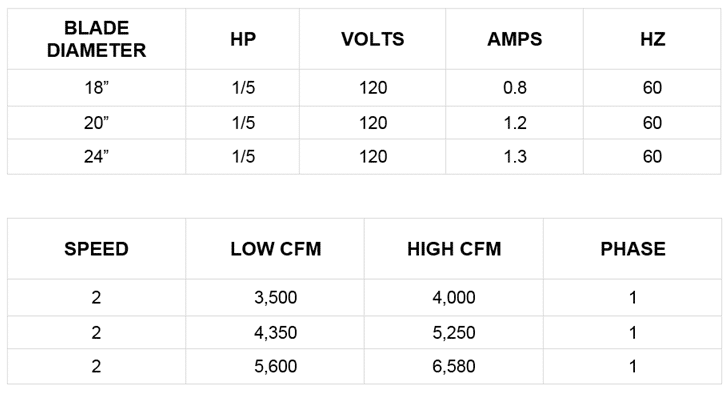 That's why 18" DirectAire Stir Fans offer CCFM/Watt ratings of up to 26.41. We know that in the real world fans get dirty. Very dirty. That's why we designed the DirectAire Stir Fans to have a much higher maximum amp rating than the operating amp rating. This allows the fan to continue to operate perfectly when dirty instead of burning out the motor. Life in a poultry house is harsh if you're a fan motor. That's why DirectAire Stir Fan motors are sealed to keep out environmental dust to allow our circulating fans to keep running at their full potential.